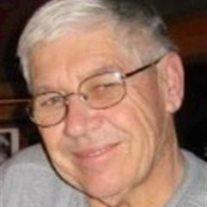 Marvin Rex Arnett, 78, of Mesa, AZ, passed away peacefully on Thursday, May 1, 2014 in Gilbert, AZ. Rex was born on March 29, 1936 in Franklin, AZ. He is preceded in death by his parents, Marvin and June Arnett, and sister, Ilene Crawford. Rex is survived by his wife Lois, and children, David Arnett, Diane (Bryon) Blackburn, Susan Arnett, Michelle (Aaron) Clark, Jon Arnett, Christopher (Danielle) Arnett, 5 granddaughters, 1 grandson, brothers, Tom (Sheryl) Arnett, Don (Marsha) Arnett, Steven (Bobbi) Arnett, and sisters, Junetta (Harvey) Clifford, Barbara (Jim) Wright, and Mary Ann Price. Rex will be remembered for his remarkable talent as an organist, musician, teacher, and story teller. He enjoyed many years as an educator and school administrator, shaping countless lives teaching music, Spanish, English, and giving private music lessons. He had a wonderful wit and sense of humor, and a deep love for his family, his heritage, music, the Spanish language and hispanic culture, the gospel of Jesus Christ, and telling stories to delight children and adults alike. He was an active and faithful member of The Church of Jesus Christ of Latter-Day Saints, which membership he cherished, and particularly enjoyed serving in the Mesa LDS temple in his later years. A visitation in honor of Rex will be held Thursday, May 8, from 6:00 – 8:00 p.m. at the Bunker Garden Chapel, 33 N. Centennial Way, Mesa, AZ. Funeral services will take place Friday, May 9, at 10:00 a.m. at the LDS Kimball East Stake Center, 4640 E. Holmes Ave., Mesa, AZ, with a one-hour visitation preceding. Rex will be buried in his birthplace of Franklin, AZ, with graveside services to be held Friday, May 9, at 4 p.m. at the Franklin, AZ Cemetery.